Real Name: The Missing Link. Once he mutated his powers seemed to change over time (or perhaps as writers came and went). Initially he retained his incredible strength, but also had a genius intellect. He was still subject to fits of rage to start with. Then he appeared to lose his physical might except when enraged, at which point his strength returned at the cost of his intelligence. Then it was established that he retained some of his superstrength, though not as much, even when not angry. But shortly after this he snaps a metal girder like a twig, which implies he has regained his full strength - he also never loses his intellect again, so perhaps his mutation was beginning to stabilise. Eventually he discovered he could fly as well. 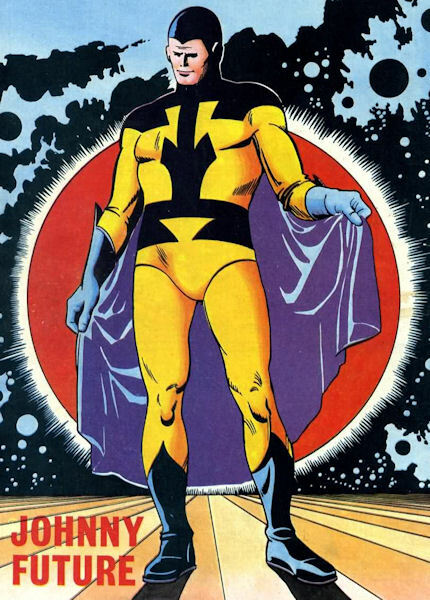 In Fantastic Annual 1969 Johnny briefly returned, and demonstrated the ability to separate his astral form from his physical body and thus travel over vast distances in space. Since he recognises a piece of alien material as only being found on the planet Xenon, presumably he must have used this power extensively. History: The Missing Link was, as his name suggests, a prehistoric creature part way between a man and a great ape. He was discovered by an expedition run by 'Bull' Belson to a remote region of the world. It was Bull's secretary and photographer, Lita Munro, who initially attracted the Link's attention, drawing him out of hiding. After facing the Link's rampaging strength, the expedition fled, but the Link's fascination with Lita continued, and he followed them. Let loose in Britain, he ended up fleeing the authorities, finally hiding in an experimental nuclear research facility, where he was exposed to radiation from a sabotaged reactor. This caused the Link to evolve at an accelerated rate, until his intelligence "becomes equal to that of the kind of man who will be born millions of years from now." With his new intellect he was able to avert the sabotaged reactor from exploding, but he was wrongly blamed for causing the damage in the first place. Imprisoned, he swiftly learned English using his new genius, but the only ally he had was Lita, who recognised him for who he used to be. He escaped in an attempt to prove his innocence but ended up being blamed for further crimes instead. Rejecting Lita in order to protect her, he adopted a new identity. 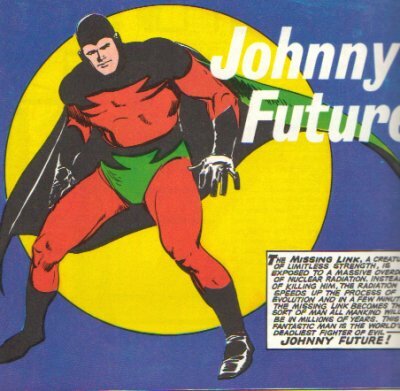 As Johnny Future, he was a costumed hero who fought villains such as the Animal Man, Disastro and the Secret Society of Scientists, amoral geniuses, while as John Foster he was a caretaker at Harwood Electronics, a job he got after saving the son of the CEO from being kidnapped. 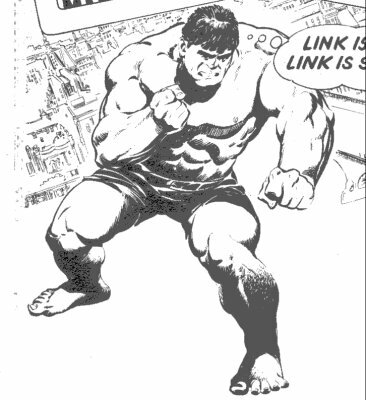 Comments: Starting off as a blatant rip-off of the Hulk, the character underwent a bizarre change into a costumed hero strip just less than four months after it started. Continuity was not the strip's strong point - he rescues young Larry Harwood of Harwood Electronics in #23, but by #26 Larry is now known as Rick, with no explanation ever forthcoming. The strip was originally drawn by Spanish artist Luis Bermejo. However the poster of Johnny Future used at the top of this page was one of a series drawn for the back of the comic by a young artist Barry Smith - who made a name for himself in America a couple of years later under his full name: Barry Windsor Smith.